So, taking for granted that one is fully aware of what they are to expect while watching Wrath of the Titans, they definitely get that here. Perseus (Worthington), who stepped out of the limelight at the end of the first film, the decent effects extravaganza, Clash of the Titans, is beckoned by his father, Zeus (Neeson) to come back into the arena, for, you know, weak gods, tremors in the force, etc. Perseus balks at the notion in order to fill a few more minutes of screen time with an effects-laden dream. Meanwhile, Zeus is, you guessed it, betrayed and captured, by a couple of bad guys, one old (Fiennes as Hades) and one new. Brother Poseidon (Huston) survives long enough to pass on plot points to an increasingly curious Perseus. Shortly afterwards, a cool two-headed beast attacks Percy’s town, and he gets his taste for the old life. Worthington plays his “retirement” for what it’s worth. He is creaky and filled with a sufficient amount of self-doubt to get the ball rolling cautiously. Worthington, who did a good job in the first film portraying a “hero by accident,” is right in his wheelhouse here. In human time, it’s been around 10 years. He married Io, who bore him a son and, conveniently died before the events of the movie. One knows this is mainly so he can have one more shot at love later in the film with another name actress. That actress is Rosamund Pike, taking over for Alexa Davalos as Andromeda. Just like the first film, the movie looks good. The only disappointment being the confined, poorly edited fight with the Minotaur and the cyclops family. There wasn’t much to see, and it definitely did not match the cool monster to the left of the poster above. It came across more like the kid from Mask with two broken corn cobs stuck in his head. The 3 cyclops have a decent lead up, until you get too close and see how the animation is not…quite…there. The other battles, especially the one against the Chimera, are decently story boarded and look good, too. 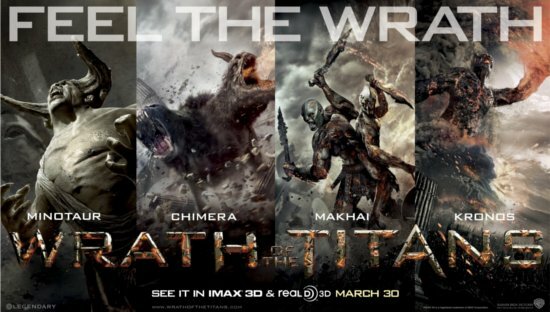 Wrath of the Titans was filmed in 2D, but it edited for 3D. As a result, we see a ton of shots that look like stuff coming at you. It’s annoying, no matter the dimension, but there are plenty of decent shots to balance it out. The net result gives one the impression of the film equivalent of throwing a bunch of stuff up on the wall and seeing what sticks. The plot is nonsense, and having actors the caliber of Huston, Fiennes, Neeson and Nighy fails to improve it much. That Neeson spends most of the film in captivity with Fiennes standing guard feels a little like having Meryl Streep sit at your house to wait for the cable guy. Lot of talent wasted. What is not wasted is Worthington. He was made for this crap. He has billions of receipts to his credit, but he, like everyone watching the film knows it’s not him they are coming to see. This results in an every man performance where he gets to spend much of the film in utter amazement to all the blue screen magic that is going on around him, only not while he is there. It is a special charisma that may never net him an Oscar, but is way more appealing than that French guy in The Artist. The rest of the acting, including Pike, is not anything that will get the actors work in other films, unless they make it to the sequel. Overall, I enjoyed this film as much as I did the first one. Not quite enough to buy, but I would not turn the channel if I saw it on TNT in 2 years. Previous Post CPE and Em: The Amazing Spider-man may not be necessary, but it is good. I haven’t seen the movie, but I probably wouldn’t buy it judging from the mixed reviews on Wrath of the Titans. I’ve asked many friends coworkers and some say it was good, while some say the only thing good about it was the special effects. I could see that. However, I would still like to see the movie just to I can form my own thoughts about it. I’ve actually already added Wrath of the Titans to my queue, and since special effects are the strong point of the movie, I’ll get it on Blu-Ray. At least I’ll have an idea of what to expect! Great review!